Birmingham Airport says the proposed new high-speed rail link between the city and London could be a solution to runway capacity problems in the South. Airport bosses said it will be quicker to get to London from Birmingham than from London Stansted if it is approved. Proposals for the 250mph rail link show it will take 39 minutes to get from Birmingham International to London. Opponents say it will ruin the environment and that there is no case for it. Chris Crean, from environmental campaign group Friends of the Earth, said it was important that full analysis work be done to see if HS2 would be a green form of transport. He said: "The really important issue about the aviation sector is that it does not pay the full cost for the pollution that it causes." Birmingham International station is situated next to Birmingham Airport. London Stansted airport is a 45-minute journey from the capital and getting to London Heathrow by the underground system can take 50 minutes from parts of the city. But a spokesman for Stansted said people from the Midlands already had direct rail access to the airport. He said: "Stansted already has a direct rail link to central London taking just 45 minutes, which is up and running with new trains coming this year. "We also have daily rail services from Birmingham New Street, so people from the Midlands also have direct rail access from Stansted to more European destinations than any other airport in the world." When London's Crossrail is up and running, in about 2012, it will take about 45 minutes to get to Heathrow from the centre of London. 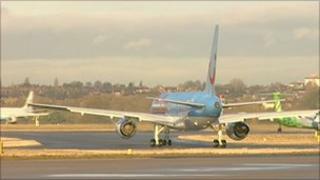 John Morris, of Birmingham Airport, said the airport had the capacity for another nine million passengers and added that the South East's runways were "over heating". "There is very limited runway capacity and we are part of the solution to that," he said. "We don't need to build more runways when we have another nine million capacity tomorrow." The airport currently handles up to 10 million passengers a year. Will high-speed rail boost all the region's businesses?